From 31 August – 2 September CHART Art Fair takes over Kunsthal Charlottenborg to gather 32 of the leading galleries in the North. In connection with the art fair is CHART Social, which is a program consisting of a range of cultural events and exhibitions exploring art, design, architecture, music, performances and talks – and everything in between. The admission to CHART Social is free and everyone is welcome. The program takes place at Kunsthal Charlottenborg and other places in the city. Malin Bülow’s site-specific work ‘Elastic Bonding’ consists of two physical bodies encased inside textile membranes forming voluminous shapes that become extensions of the architecture in the courtyard of Charlottenborg. 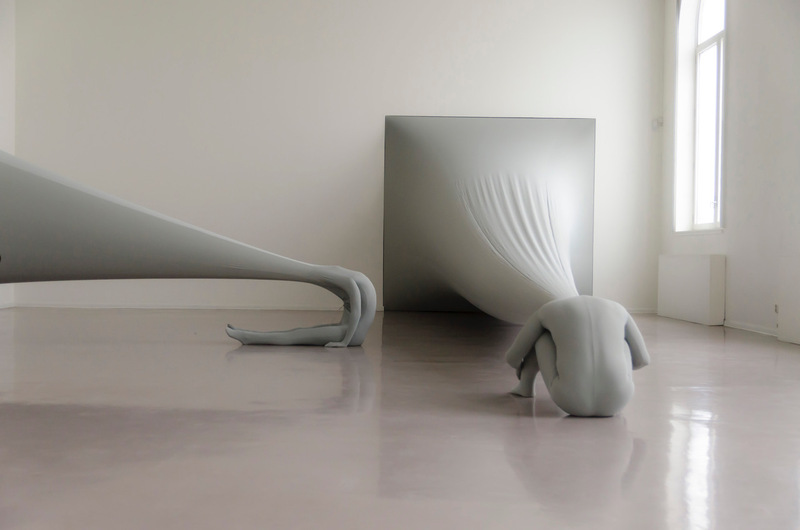 The Swedish artist’s large scale performative sculptures explore elasticity in relation to body, skin, architecture and movement, initiating an ambivalent sense of rigidity and flexibility. For the second year, Helga Christoffersen, Associate Curator at the New Museum, New York, will curate a group exhibition comprising the works of artists who, having completed their formal education, have recently put forth a distinct position within the larger artistic landscape. CHART Emerging is a platform dedicated to supporting the new generation of artists in the Nordic region at a moment of budding artistic development. The exhibition will be presented at Festsalen at The Royal Danish Academy of Art. Is culture something you own or something you share? Can art have both money and morals? In a series of talks curated by ArtReview, CHART focuses on and discusses issues of access and ownership in the sphere of contemporary art, design and architecture. The talks will be moderated by Mark Rappolt, Editor, ArtReview, and Oliver Basciano, International Editor, ArtReview, and Justin McQuirk, Chief Curator, Design Museum, London. The talks will be held at the Royal Fine Art Academy’s Kuppelsalen at Charlottenborg. CHART Architecture intends to promote young, Nordic architects and explore the crossover between art, design and architecture. Five winning teams will challenge our understanding of architectural forms and materials with their pavilions FRAME, OPEN RESOURCE, The Many Chairs Pavilion, Tight Knit and Cloud 9.0. Applying modular design, recycled plastic, zero-waste production, flat-pack construction, large scale knitting, traditional crafts and digital technologies, the pavilions will challenge our understanding of architecture. The pavilions will be shown in Charlottenborg’s courtyards. Read more about CHART Art Fair here, here and here. Schedule for CHART Social at Kunsthal Charlottenborg here and here.